Join CBC's Garrett Hinchey and a rotating cast of guest commentators for results and reaction as Nunavut heads to the polls October 30. @jane In Iqaluit, CFRT was key to engaging the public in the candidate forum. At the community level, though I wasn't able to listen, in my experience, radio is a key communication tool to engage as a candidate, and importantly for community members to share their ideas and concerns. Greenland has a party system and it works well there. I'm back! TV is terrifying. @jane.sponagle I know right - on paper you'd think he would be a lock! I personally think he'll pull it out in the end, but Mr. Teed will make it close. Interesting that social media and Facebook in particular is much more prevalent in this election and has played more of a role in getting platforms and ideas out than last - we have only had 3G cell service/data since 2015. I think it's become very important to have a strong social media game. Hey guys, here's a question from a reader on one specific riding - would love to hear your thoughts. @garrett You're a natural! But welcome back! @Aggu that is interesting! I know social media played a bit of a role in the 2013 election, but primarily in Iqaluit. And in 2013 we thought that was a huge deal. Little did we know! 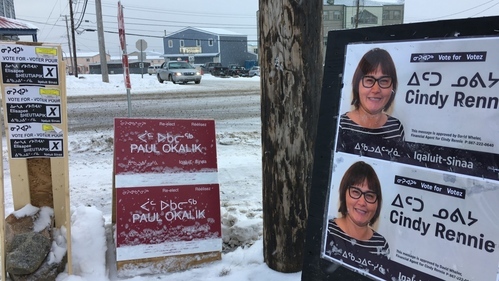 Paul Okalik and Elisapee Sheutiapik previously squared off in the 2008 election in what was then Iqaluit West. Then, Okalik won by just 7%. CBC NewsCandidates in the riding of Iqaluit-Sinaa point to housing as the pressing issue in their constituency. Ooo, I'm a little distracted by the radio coverage, Madeleine was just about to talk about the Cambridge Bay riding before getting interrupted with some results. For those who are following along on TV or radio (or thinking about it), Madeleine is sitting down now with outgoing Premier Peter Taptuna. Pitsiulaaq, we've already talked about some of the candidates who've expressed their desire to be premier - are there any candidates that you'd like to see potentially stepping up to the top job? And a follow up question for both of you - what do you think Premier Taptuna's legacy will be when people look back on his time in the premier's chair? Terrific election coverage tonight for #nuvotes! Great work @Allakariallak @JordanKonek, Pauline ... Nice to watch while away at school! @Tagak Welcome to the live blog, Mr. Curley! @garrett I haven't put much thought into that. I think Elisapi said it best during the debate, when she said that we need leaders that can bring people together. That's a big question, Garrett. I still feel too close to give an overall look at his legacy yet. Ask me in November. Which I guess is only 2 days away. Ask me about Taptuna's legacy in two days! Pitsiulaaq, what were your thoughts coming out of the debate here in Iqaluit? Anyone stand out to you? @garrett I would have liked to have seen more impact on the levels of violence and self harm in our communities. Joe Enook has an early lead in Tununiq with 1 poll reporting. In Pangnirtung, Margaret Nakashuk is in the lead with one of three polls reporting. Besides Tununiq, I believe those are all non-incumbent candidates in the lead. Any of those stand out to you two as something that would be a surprise if the result holds? Also, two polls out of three in in Rankin Inlet South - Lorne Kusugak opening up a big lead over incumbent Alexander Sammurtok. I don't have a ton of experience with elections in Nunavut, but I live blogged elections in the NWT in 2015 and in Yukon in 2016. In both of those elections, we saw a ton of incumbents lose their seats and wound up with radically different groups of MLAs. With all these non-incumbents leading (some by wide margins), I wonder if we'll see the same thing here tonight. One of four polls reporting in Quttiktuq. David Akeeagok way out in front with 44 votes. There are NINE candidates there.